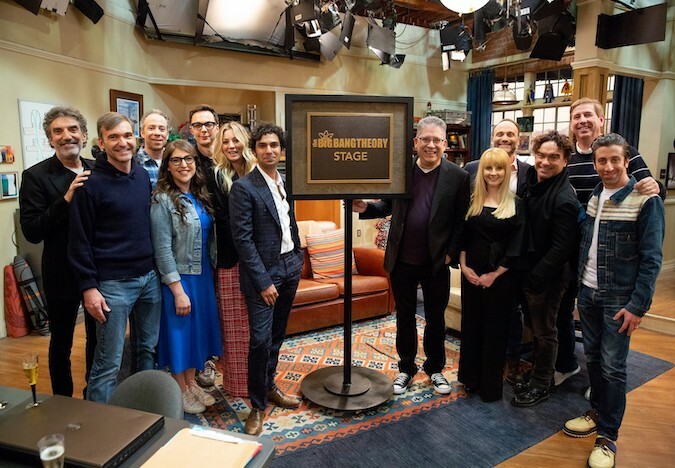 To celebrate the remarkable achievement of Warner Bros. Television’s “The Big Bang Theory” — which will sign off in May 2019 as the longest-running multi-camera series in television history, with 279 episodes — Warner Bros. Studios has dedicated Stage 25, where the hit comedy is filmed, as “The Big Bang Theory“ Stage at a ceremony during the Television Critics Association’s Winter Press Tour Studio Day on February 7, 2019. Celebrating the final season at the Thursday afternoon event, Warner Bros. Chairman & CEO Kevin Tsujihara and Warner Bros. Television Group President & Chief Content Officer Peter Roth joined series stars Johnny Galecki, Jim Parsons, Kaley Cuoco, Simon Helberg, Kunal Nayyar, Mayim Bialik, Melissa Rauch and Kevin Sussman, executive producers Chuck Lorre, Steven Molaro, Steve Holland and Bill Prady, and director Mark Cendrowski to dedicate the stage. Originally built in 1935, Stage 25 has housed productions of “Casablanca,” “Giant,” “Bonnie and Clyde” and “Blade Runner,” as well as television series “Maverick,” “V,” “What I Like About You” and more. This is only the fifth time in the history of the Warner Bros. Studios lot that a soundstage has been “named,” instead of numbered. In 2004, Stage 24 was declared The ”Friends“ Stage; in 2009, Stage 11 was renamed The ”ER“ Stage; in 2015, “The Ellen DeGeneres Show” commemorated its first 2,000 episodes with Stage 1 becoming The ”Ellen“ Stage; and also in 2015, Stage 26 was dedicated as The ”Two and a Half Men" Stage, to honor the 12-season run of another successful Chuck Lorre comedy. “The Big Bang Theory” will shoot its final episode on Tuesday, April 30, to air later in May 2019 (Thursdays at 8/7c on CBS). Currently in its 12th season, “The Big Bang Theory” is produced by Chuck Lorre Productions, Inc., in association with Warner Bros. Television.